1 BigData AnalyticsPanel-Diskussion DMS EXPO 2013Moderation Dr. Joachim Hartmann Richard Medina Co-Founder & Principal Consultant Workplace. 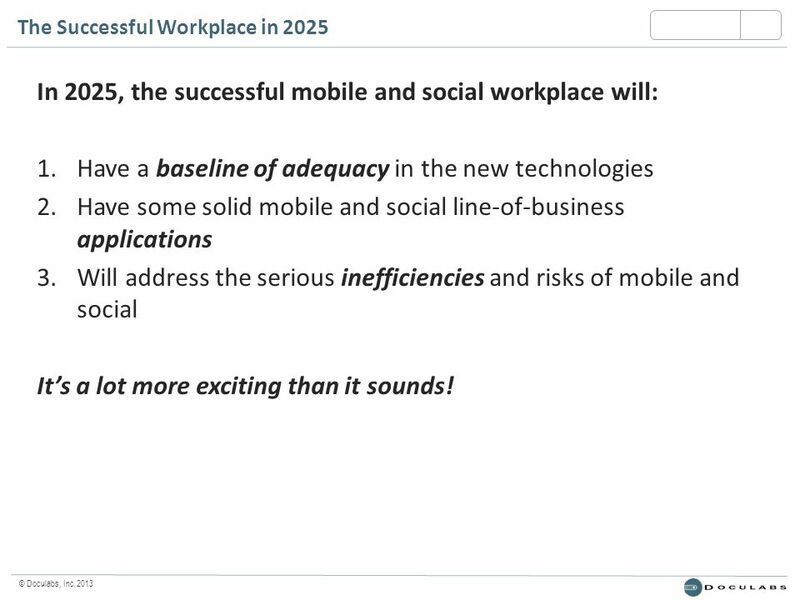 4 © Doculabs, Inc. 2013 The Successful Workplace in 2025 In 2025, the successful mobile and social workplace will: 1.Have a baseline of adequacy in the new technologies 2.Have some solid mobile and social line-of-business applications 3.Will address the serious inefficiencies and risks of mobile and social Its a lot more exciting than it sounds! 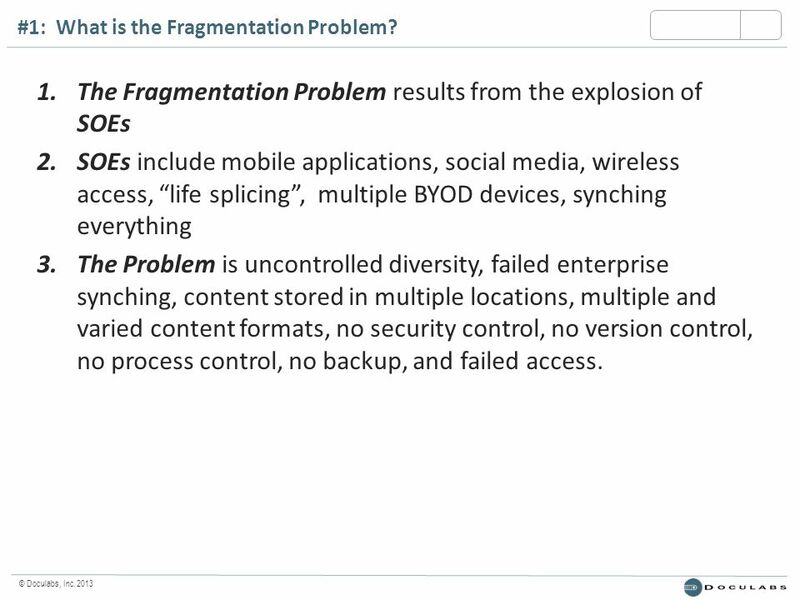 6 © Doculabs, Inc. 2013 #1: What is the Fragmentation Problem? 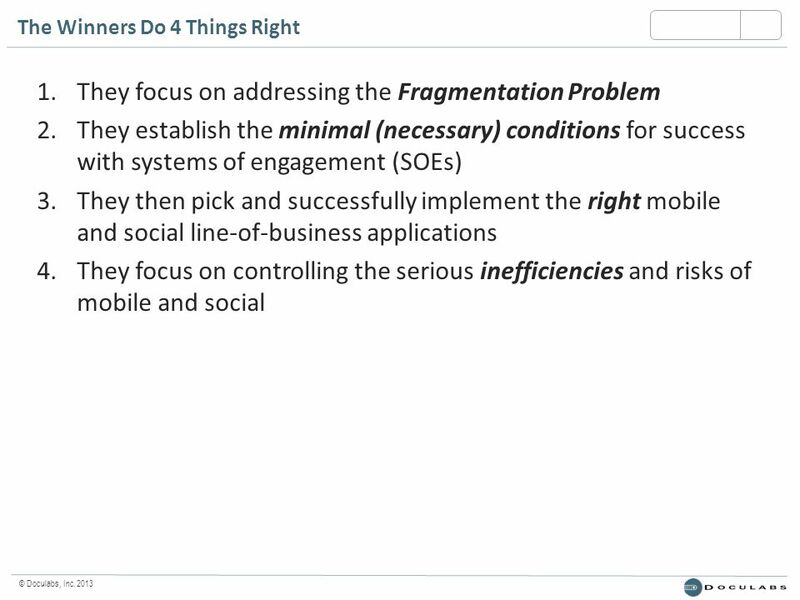 1.The Fragmentation Problem results from the explosion of SOEs 2.SOEs include mobile applications, social media, wireless access, life splicing, multiple BYOD devices, synching everything 3.The Problem is uncontrolled diversity, failed enterprise synching, content stored in multiple locations, multiple and varied content formats, no security control, no version control, no process control, no backup, and failed access. 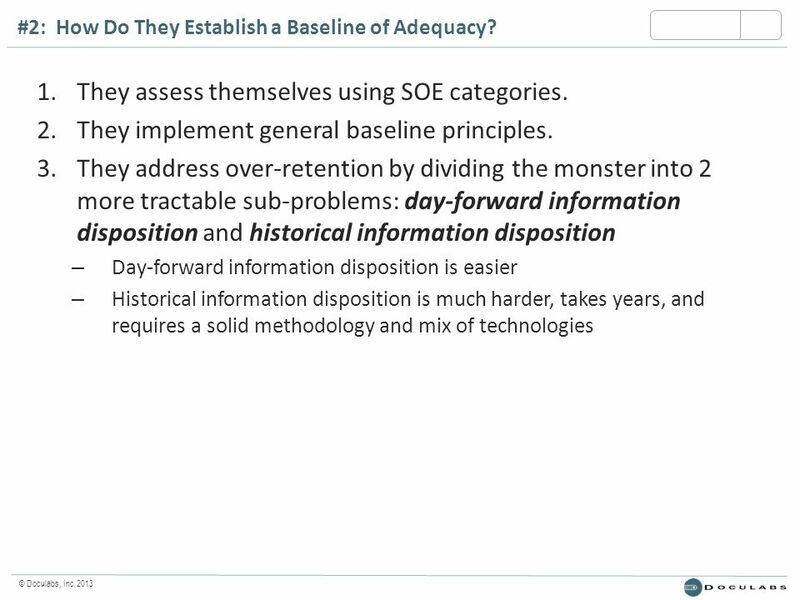 8 © Doculabs, Inc. 2013 #3: Which SOE Applications Do They Implement? 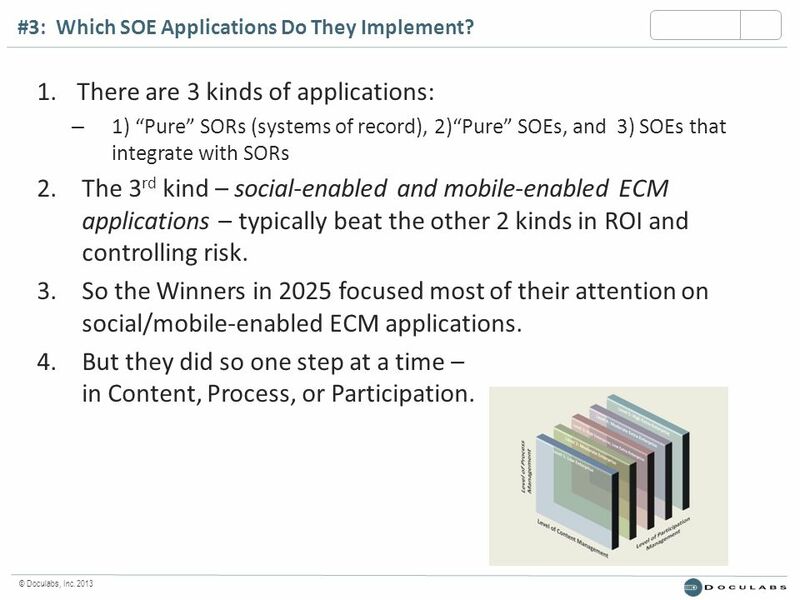 1.There are 3 kinds of applications: – 1) Pure SORs (systems of record), 2)Pure SOEs, and 3) SOEs that integrate with SORs 2.The 3 rd kind – social-enabled and mobile-enabled ECM applications – typically beat the other 2 kinds in ROI and controlling risk. 3.So the Winners in 2025 focused most of their attention on social/mobile-enabled ECM applications. 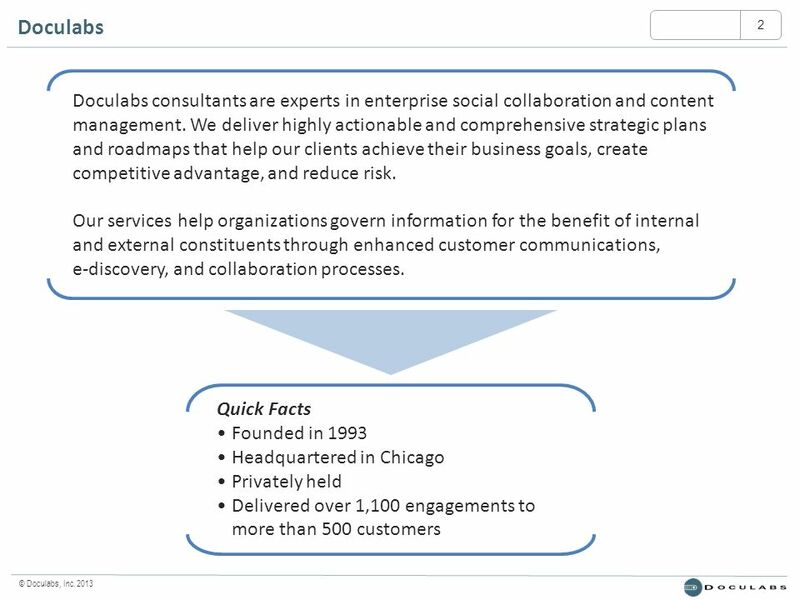 4.But they did so one step at a time – in Content, Process, or Participation. 9 © Doculabs, Inc. 2013 #4: How Do They Address the Risks and Inefficiencies of SOEs? 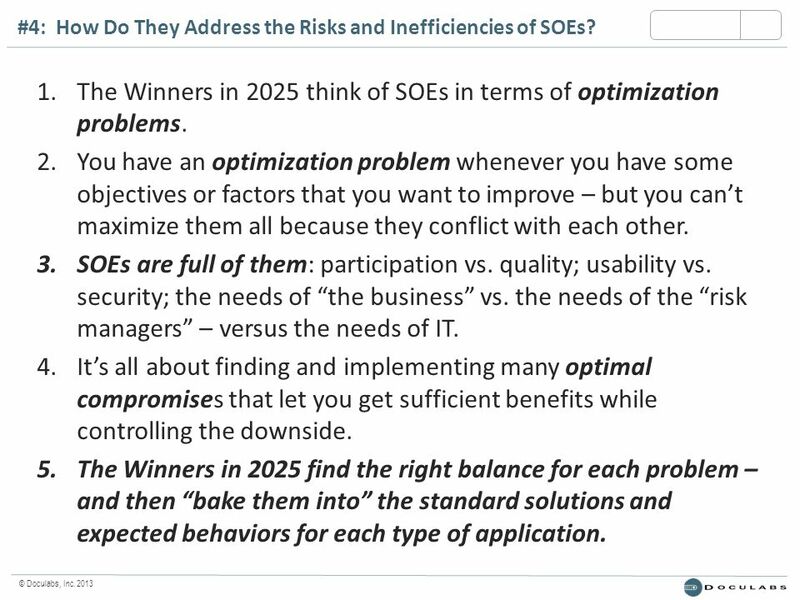 1.The Winners in 2025 think of SOEs in terms of optimization problems. 2.You have an optimization problem whenever you have some objectives or factors that you want to improve – but you cant maximize them all because they conflict with each other. 3.SOEs are full of them: participation vs. quality; usability vs. security; the needs of the business vs. the needs of the risk managers – versus the needs of IT. 4.Its all about finding and implementing many optimal compromises that let you get sufficient benefits while controlling the downside. 5.The Winners in 2025 find the right balance for each problem – and then bake them into the standard solutions and expected behaviors for each type of application. 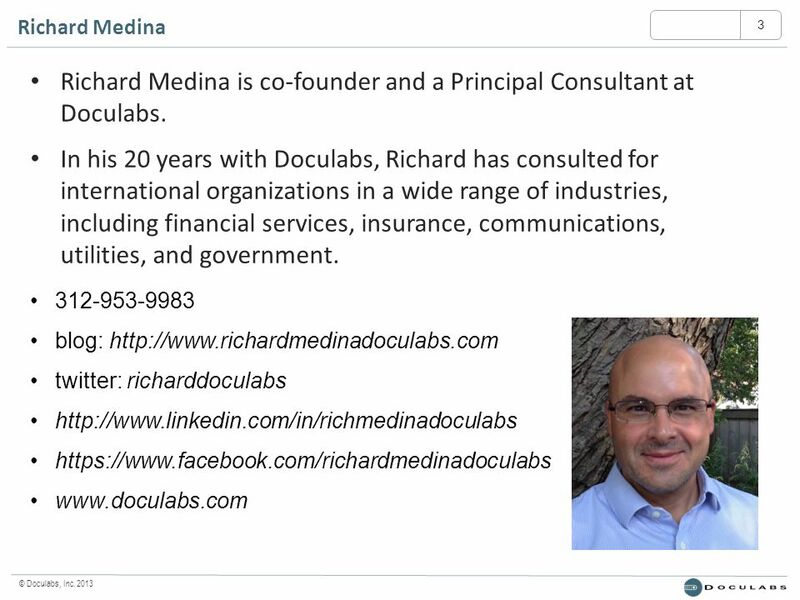 Download ppt "1 BigData AnalyticsPanel-Diskussion DMS EXPO 2013Moderation Dr. Joachim Hartmann Richard Medina Co-Founder & Principal Consultant Workplace." Translation in the 21 st Century Impacts of MT and social media on language services. Infrastructure Services. Introducing Al-Futtaim Technologies One of the regions leading System Integrators Strong partnerships with leading global ICT. 1 BigData AnalyticsPanel-Diskussion DMS EXPO 2013Moderation Dr. Joachim Hartmann Richard Medina Co-Founder & Principal Consultant The Future. 1 BigData AnalyticsPanel-Diskussion DMS EXPO 2013Moderation Dr. Joachim Hartmann Richard Medina Co-Founder & Principal Consultant Safe Bets. 1 BigData AnalyticsPanel-Diskussion DMS EXPO 2013Moderation Dr. Joachim Hartmann Pamela Doyle Director The Capture Continuum. ISACA All rights reserved. Unlocking the Value of Technology Investments Speaker Name/Title Date. New Features of Financial Reporting David Grande eCapital Advisors. Towards Employment ACHIEVE Program Innovative Solutions to Workforce Development December 21, 2004. Mobility in Government Consolidation & Wrap-up Lee Naik3 Oct 2013. © 2014 Fair Isaac Corporation. Confidential. This presentation is provided for the recipient only and cannot be reproduced or shared without Fair Isaac. Uses of Voice Documentation A Talkument Overview. Building the case for Windows 8.1 Flexible Workstyle deployment Windows 8.1 Business Value Workshop Microsoft Consulting Services can help you build the. HZTAdvantage© Methodology Overview HZ Technologies, LLC Doc ID: CON02.